Analytical services of dispersed particles using patented magnetic susceptibility technology. Production and distribution of nanomeasure-unit. Consulting service of particle development and measurement. Comprehensive global business development supports. Biospire having its motto on “Early Stage Technology Management” has been supporting comprehensive business development since the company was in preparation of setting up. Biospire will continuously support Kawano Laboratory with creating new market concept to the global market with linking oversea academia and industrial researchers. Magnetic susceptibility is a specific index belong to the type and properties of any particles. This index, however, has not been utilized in particle measurement due to extremely low signals obtained without designated apparatus. With applying super-high magnetic filled gradient, each particle starts to be motile (i.e. 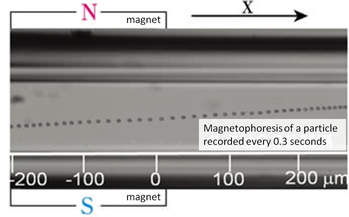 magnetophoresis) with being able to measure parameters such as migrating velocity. Index for specific particle can be obtained even from particle dispersion or stable mixtures, so that this technology will be able to be applied to industrial R&D and quality control in ink, cosmetics and a number of industries. 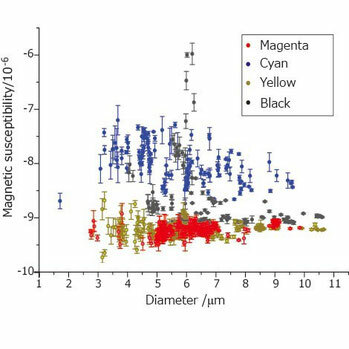 This index using magnetic susceptibility can be used as an independent apparatus, but also enables to use as a supplemental devise with classic methods such as zeta potential and raman microscopy. Kawano Laboratory was established after their incubation period with successfully completing a three-year entrepreneurship fund program from JST (Japan Science and Technology Agency) with also applying and filing patents for key technologies. A number of preliminary studies have also been carried out with cosmetic, ink and food industries with establishing pilot type of measurement apparatuses. “Magnetophoresis and the magnetic susceptibility index have lots of marketing potential being able to be used in the industry if adequate devises are established kind to the users. This technology can measure not only the surface of particles but also internal pore information and other parameters that cannot be measured by existing methods”, says Dr Makoto Kawano, CEO at Kawano Laboratory. After having academic experiences from chromatography application, Dr Kawano decided to launch his own company to specialize on magnetic susceptibility in 2011 to create new tool and concept in the analytical market. Kawano Laboratory has its office and laboratory in Suita Campus of Osaka University in Osaka with welcoming collaborative researchers both from industry and academia to create open innovations. The company has three business models; 1) develop market and devises collaborating with equipment companies, 2) CRO services using in-house devise to generate data, and 3) consultant services using knowledge and know-how to measure and design particles and those mixtures. Kawano Laboratory offers highly flexible services for the consulting services to overcome the problems that the clients have in particle designing and evaluation. In one case study, the company supported a client with establishing new quantitative index using magnetic susceptibility to overcome a problem that the client had to rely on an organoleptic tests for many years which resulted in producing off-spec products due to instability of the measurement methods. susceptibility of a particle under magnetic fource. Figure 2. Example of application of magnetic susceptibility on printer ink. susceptibility (Y) and particule diameter (X). The above information is available.